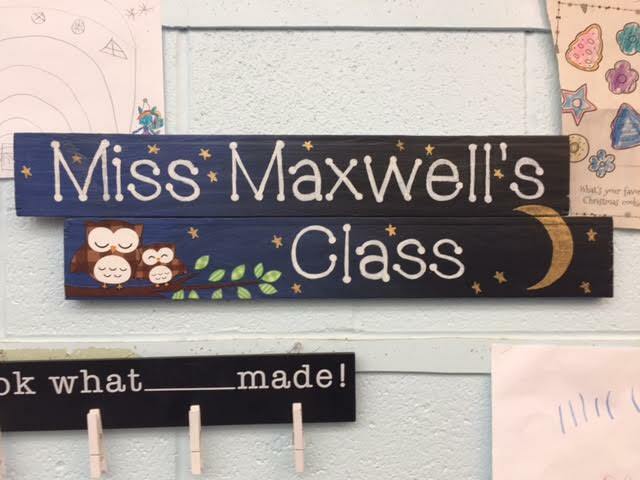 Caitlin Maxwell loves teaching in her classroom at St. Elizabeth of Hungary, a classroom where she was once a young student! DALLAS—The famous poet Thomas Wolfe may have said, “You can’t go home again.” But he obviously didn’t meet Cedar Hill resident Caitlin Elizabeth Maxwell. A 2007 graduate of St. Elizabeth of Hungary Catholic School in Oak Cliff, Caitlin loved “growing up” in the home of the Saints. She went on to attend high school at Ursuline Academy. Then she studied sociology at the University of Texas at Dallas. Upon graduation, she applied to be a teacher at St. Elizabeth’s. She admits that, although she enjoys sociology, she always thought she’d become a teacher. And it helped that the new Principal at St. Elizabeth’s, Mrs. Dzurilla, was one of her favorite teachers at the school when Caitlin was a student there. 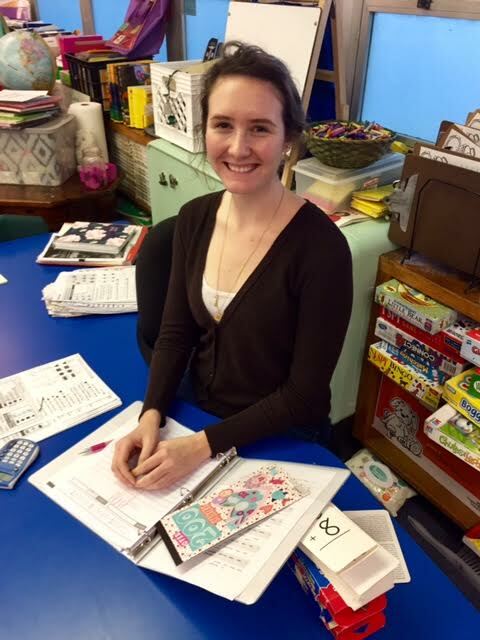 What Caitlin can help is encouraging her 21 students in her first-grade class. A typical public school classroom is full with 24 to 25 students, so she feels blessed with her current 1 – to-21 teacher-to-student ratio. After all, it’s her first year of teaching, and she must teach all subjects: math, science, social studies, religion. The oldest of three, Caitlin has a sister, Erin, who also attended St. Elizabeth’s, and graduated from Ursuline, class of 2013, and her brother Cooper, who attended St. Elizabeth’s and then graduated from Bishop Lynch High school in 2015. Their parents, Melissa and David, met in high school and the family lives in Cedar Hill. If she didn’t become a teacher, her dream as a student at St. Elizabeth’s was to become and actress. She was in two plays at St. Elizabeth’s, including playing a fairy godmother in one, and a Lion in “Pecos Bill.” And of course, there was her other brush with fame. As she worked a summer job next to the Granada theater, while serving up smoothies on lower Greenville avenue, she made one for actor Jeff Bridges. But she had no idea who he was. It was her manager who clued her in to his fame as an American actor, singer, and producer, and a member of a prominent acting family—basically an icon. He even won the Academy Award for Best Actor for his role as Otis “Bad” Blake in the 2009 film Crazy Heart, and earned Academy Award nominations for his roles in The Last Picture Show, Thunderbolt and Lightfoot, Starman, The Contender, and True Grit. “Yeah, I sort of missed all that,” Caitlin admits with a shrug. Even today, she’d just as soon curl up at home with a good book than head out to the moves. Her other favorite hobbies include cooking pasta dishes, and cycling, which is a good thing because she admits pasta can pack on the pounds. She goes to cycling classes in Snyder Plaza. But her first love is what she does eight hours a day: teaching. And going “home” to the school where she first learned to love learning has made her happy. Her best friends today were the friends she made while attending St. Elizabeth’s, some of whom she chats with every day. Caitlin is proud to be a St. Elizabeth of Hungary Saint once again, proving Thomas Wolfe wrong: you can go home again. 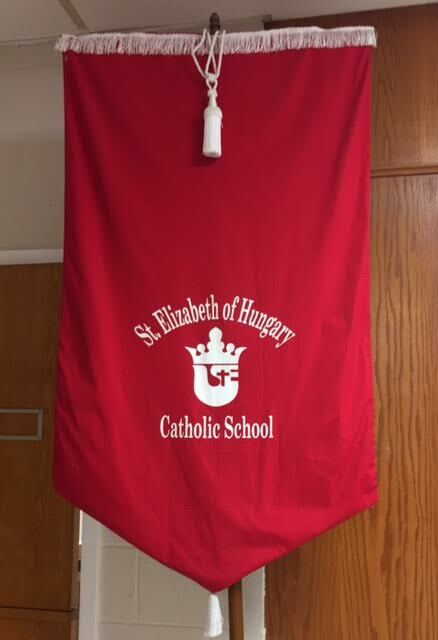 St. Elizabeth Of Hungary Catholic School is having an Open House from 8:00 a.m. to 3:00 p.m. on Wednesday, February 8, 2017. The school has classes from pre-k3 to 8th grade. The public is invited to come tour the school and meet the exceptional faculty and staff. For more information, see the school’s website www.saintspride.com.